civitasblog: What if we organized a worldwide contest for the best marketer ever? What if we organized a worldwide contest for the best marketer ever? According to the article of Stephanie Fierman, Managing Director at Marketing Mojo LLC we all know who he is, we have sent him letters, we have sung for him, we give him sweets and candies every year -although he should keep an eye on his food habits- and, especially, given Greece's financial situation most of us are counting our hopes on him for this year’s presents! “ o Long-term reputation management: No steroid use or bogus investment schemes here. Ever. Santa is one reliable dude. And he appears to do what’s right even when no one is looking. o Brand promise and the “continuous connected experience”: No matter where you go, you get the same reinforcing message from and about Santa Claus. Movies, television, email, social media, online video, radio, snail mail, retail – it doesn’t matter. He has a booming voice, he’s fat, he wears a red suit and he brings good stuff. o Accurate, On-Time Delivery. Neither WikiLeaks, nor Chilean mining disasters, nor 0% interest rates will keep Santa from delivering the goods on Christmas Eve. o Supply Chain Management. You have to admire the man’s ability to manage his vendors, handle inventory, move the merch and turn on a dime. Your kid decides at the last minute that she wants a Wii instead of the bike that Santa has already bought and loaded on the sleigh? The Wii will be under the tree, for sure. o Never any hidden charges: There are no Congressional Committees convening to discuss whether Santa is taking advantage of consumers. There are no pending FTC rules in the pipeline. No small print. o Santa’s pricing policies appears just perfect, in every product category ever invented. And shipping is always free. o Brand advocacy. Think of all the parents who read stories about Santa, take their children to see Santa and tuck said children into bed on Christmas Eve with the promise that Santa will soon arrive with presents. Even adults will sometimes tell each other what they want from Santa. The dude’s got an army of advocates carrying his message each and every year, and everyone’s happy to do it. o Returns and Exchanges. No problem. While one of Santa’s elves may ask you to accompany him to the mall, that’s a small price to pay for better loot. o Long-term view of the customer relationship: Santa is committed to lifetime value. If you’re a kid, he wants you to tell your parents and your grandparents and your teachers all about what you want. He wants you to post what he gave you on Facebook. He wants to take a picture with you and your friends at the mall. Santa: the ultimate “circle of life” promoter. o Customer targeting and personalization: If you ask Santa for an iTouch, you’re going to get an iTouch. And if you state a preference, Santa is also highly likely to deliver an iTouch in the colour of your choice. o He invites you to be a vital part of his brand and help make the world a better place. Be nice, get your gift. Be naughty, and you’re on your own. No anonymous troll behaviour on the Web, no TMZ stories, no threatening or yelling. Everyone knows the rules, the rules don’t change and there are big rewards for all. Or not. 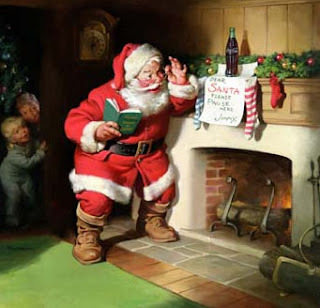 Santa Claus is the best marketer ever - isn’t he?